*-เฟสบุ๊คนี้ถูกบล๊อค 2 วันครับ เขาว่าเราทำผิดกฎของเพื่อน ว่าเราเข้าไปแสดงความเห็นในหมู่ที่เขายังไม่รับเราเป็นพวกเขา เขารับความเห็นของเราไม่ได้ เรื่องเกิดขึ้นขณะที่เข้าไปแสดงความเห็นในเฟสบุ๊คของ ศ.สมคิด เลิศไพฑูรย์ มธ.เมื่อวันก่อน (3 ต.ค.2554) รออีกสักหน่อยครับ /บก. *-อีกครั้งหนึ่งครับ เฟสบุ๊คผมถูกแจ้งว่ามีผู้ฟ้อง ว่าอะไรไม่ชัดเจน พวกบริหารเฟสบุคนี่บ้องส์หรือเปล่า ใครฟ้องก็เชื่อเลยหรือไร? คราวนี้ก็ว่าผมไปจุ้นจ้านนอกหมู่นอกพวก ขัดระเบียบว่าด้วยเพื่อนของเฟสบุค ให้ผมหยุดพัก 7 วัน เพราะฉะนั้นถ้าวันพรุ่งนี้ 19 ม.ค.2555 เข้าเฟสบุ๊คผมไม่ได้ ก็แปลว่าเขาให้ผมพัก ฐานละเมิดกฎเพื่อนในเฟสบุ๊ค /บก. Jo Tajima, มีฉันบ้างไหม ในจัยเทอ, Pratumporn Nontamit, and 4 other friends have posted statuses, photos and more on Facebook. Thai people ever saw a similar picture once in time of Thaksin Shinawatra,the former prime minister of Thailand brother of Yingluck Shinawatra the present prime minister of Thailand who manages this excellent ceremony for the king. The yellow is just a symbol for the king's birth day. Yellow is according to some believe of the Thai astrology the colour for Monday the day the king was born. It has never concerned any glimpse of Thai politics but a symbol of love and loyalty to the Thai monarch. 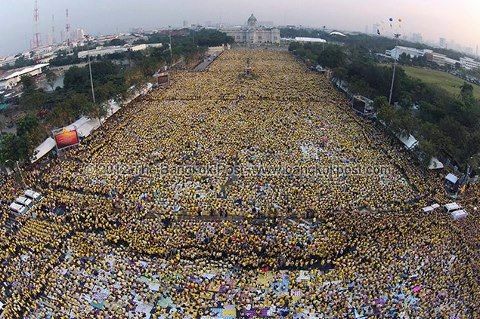 But in time before and after the coup 19 September 2006, there were some groups of political movement tried to lean on the splendid monarch by using yellow as their political symbol that has made a dirty unfair or impurity to His Majesty the King. The picture reflects the Yingluck government has accomplised to bring the yellow symbol back to the king as the real meaning of love and loyalty to the King that makes a different between yellow and red because the red [the red shirt for democracy] whose fame has been known well through the world as a colour of political idealism for democracy. โพสต์ขึ้นไปแล้ว เขาตัดข้อความส่วนที่อยู่ใต้ภาพครับ (สงสัยคนตัดเป็นพวกเจ๊กลิ้ม) แต่ผมไม่ว่าอะไรหรอก อยากรู้เหตุผลเท่านั้นเอง ว่าตัดทำไม? ผมทำอะไรให้คุณ หรือ ใคร เสียหายหรือ? When he died it was reported about how rich he was. Money in the form of a charitable trust $8.9 billion[some source say 5.5 billion]. 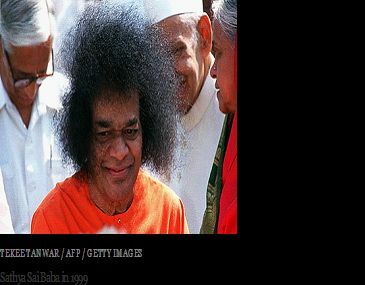 India's Home Ministry, the Sathya Sai Trust $19.5 million as found out in 2009 alone. His personal assets for example his palace, , his super International Hotel in Puttapartee etc. When he died the top men in India Government, the president of India and the prime minister of India with the cabinet came to worship him and honoured his death as God. 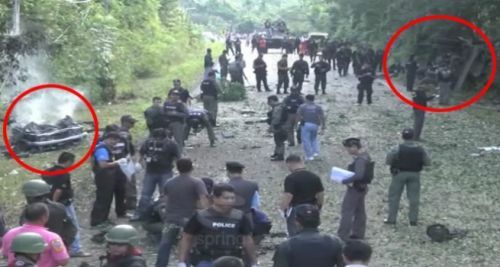 Bomb on a road 10 feb.2013 in Yala Province southern Thailand where muslim guerrillas operating their hatred over Thai people. They killed 5 soldiers. In the picture[from rural report] you see they could do nothing but walk go walk come. They are afraid as rats smelling cat.